Sennheiser veers toward the budget variety with the CX 6.00BT and sticks to its audio consistency without sacrificing too much. Lightweight, easy to use and with an app to tweak the EQ, these earphones manage to avoid coming off as cheap. Sennheiser has long held a pedigree for enabling people to bob their heads to great sound. Straddling the line between audiophiles and more casual listeners, the company aims to appeal to a wide range of listeners while maintaining a high standard of audio quality, and are always worth a listen. At this price, the CX 6.00BT only add to the intrigue. There is a barebones quality to these Bluetooth wireless earphones we could appreciate. Sennheiser likes to look a little slick with its products, but that’s not the takeaway we got after listening to tunes on these. The CX are made for the everyman out there: affordable enough to be a worthy upgrade from a cheaper pair that went bust, yet at a price point that suggests great value. They won’t be for everyone, but we generally liked what we saw - and heard. It’s clear the leading design principle was in cutting down the CX’s weight. At only 49 grams, these were among the lightest pairs we’ve ever tested. The other standout feature was the small-sized earpieces housing the drivers. If bulky earphones have caused you grief before, that won’t be a problem here. Both earpieces feature contoured frames with a slightly pinched appearance, and which should feed easily into your ears. Though the restricted size is perhaps unusual for a pair of earphones, those with ears on the smaller side should appreciate the sleeker build. 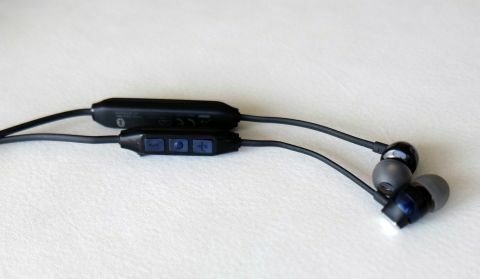 The earphones are an unassuming black, with navy blue buttons and some light silver detailing. They are plastic, but don’t feel overly cheap, which is really what we would expect from Sennheiser anyway. That being said, we would stop short of proclaiming these as winners of any beauty contest. The CX 6.00BT are a bit like their name – basic and somewhat unassuming. The cable connecting both sides is pretty standard, with an inline mic, playback controller and battery charger on the right side. A clip helps choke up any slack to keep them from dangling or falling, but we didn’t have much of a problem either way. The four sizes of eartips should ensure any pair of ears can manage here, though if none of them suffice we would recommend considering Comply Foam tips - which deform to a point where they can better passively isolate noise. We tried them to gauge performance, but also managed fine fine with the included gel eartips. It would’ve been nice if Sennheiser included a pouch or case to carry the CX 6.00BT around, but instead, you only get the bulky plastic case the earphones ship in, which we weren’t particularly keen on using on-the-go. If you have a pouch from an older pair lying around, use that. If not, you may have to invest in one separately. Keeping things simple out of the box, Sennheiser puts the CX 6.00BT in pairing mode right away. We swiftly paired them with two phones – one iPhone and one Android device. The earphones support pairing with two devices simultaneously, meaning you can listen to music on one, while then taking a call on the other, for example. A built-in voice assistant confirms a connection or disconnection, along with incoming calls and battery level. The earphones prioritize the source device sending audio over, though it wasn’t simple to regain a connection once it had been lost. We had to reboot the earphones to re-establish the wireless connection, causing a minor nuisance. Thankfully, that didn’t happen often. Cutouts were very uncommon, in fact. Sennheiser says the CX’s range is a good 30 feet, and our tests seemed to confirmed this. Unless obstructed by a wall or similar, the connection was steady within the recommended distance. We could walk around a small apartment without really losing the signal. The CX 6.00BT does support both AAC and aptX, as well as aptX Low Latency. That covers both iOS and Android software, but in the latter case, Low Latency support means video syncs particularly well with the audio. We concur with that, finding little to complain about when watching clips on YouTube, shows on Netflix or playing games. The fit is crucial to discerning how these sound. Otherwise, it becomes much easier to write them off. We say that because it took us trying a few of the eartips to get the right feel. Smaller earpieces changed how we positioned them, simply because there was more wiggle room. By default, the CX 6.00BT skew toward treble, with slight sibilance on cymbals and vocals. Bass is potent, albeit restrained enough to allow some balance. It was the mids that felt the emptiest, though not without some recourse. Sennheiser’s free CapTune app is a playback and EQ tool made to add customization for select headphones in the company’s lineup. The CX 6.00BT are among them, and we wasted no time sussing out what we could do. There are presets based on the genre of music you’re listening to, with the option of extensive customisation on the EQ. On top of that are bass and treble boosters, with sliders to control how far prominent you want these frequencies to be. Tinkering with them helped flesh out a more balanced sound for us, where hip hop, rock and jazz could sound equally resonant in their own way. It’s great to have these options, but there’s a catch: we could only use it with tunes stored on our devices or through the Tidal streaming service. The CapTune’s additional features were lost when trying to connect the app to Spotify, Google Play Music, Apple Music or any other option. On the plus side, the app can natively play MP3, AAC, WAV, FLAC, OGG, AIFF and Apple Lossless files, if you have them on your phone. We were impressed with the overall clarity of whatever we played. Streaming from an unsupported source, like those we mentioned, still sounded good, if a little flatter. We found we had to raise the volume more often when compared to listening via CapTune. Passive noise isolation is decent enough once sealing things up, but we weren’t able to block out all the ambient sound around us. Riding on the subway, the train was audible in the background, forcing us to raise the volume further. Call quality was superb on both fronts. We surprised people on the other end when revealing we were using earphones, and came away impressed at the clarity of their voices, too. Again, in noisier environments, calls might be more challenging, but the inline mic’s noise cancellation worked like a charm. Rated at “up to 6 hours” per charge, we would say it’s closer to five, especially because of how much we had to raise the volume. That’s far from impressive for a pair of wireless earphones, but we can excuse it to a degree because of the price point. The good news is we were able to get two hours of playback after only a 10-minute charge, and a full battery after 90 minutes. We would hesitate to recommend these outright for bass lovers. Maintaining a good seal does the job of bringing out the lows, but these aren’t quintessential bass-heavy earphones. They’re more even-keeled and pretty agnostic towards all genres. We’d also caution against using them in the gym excessively, because there’s nothing sweatproof going on here. These are best used for everyday commuting, light workouts or whenever the mood strikes to listen to tunes wirelessly. And you can’t go wrong with the $100 price tag. While it is a tighter race to zero than ever before for wireless earphones, we think Sennheiser did enough to stand out with a good pair in the CX 6.00BT. So long as you get some use out of CapTune, you should come away pleased with the sound on offer.